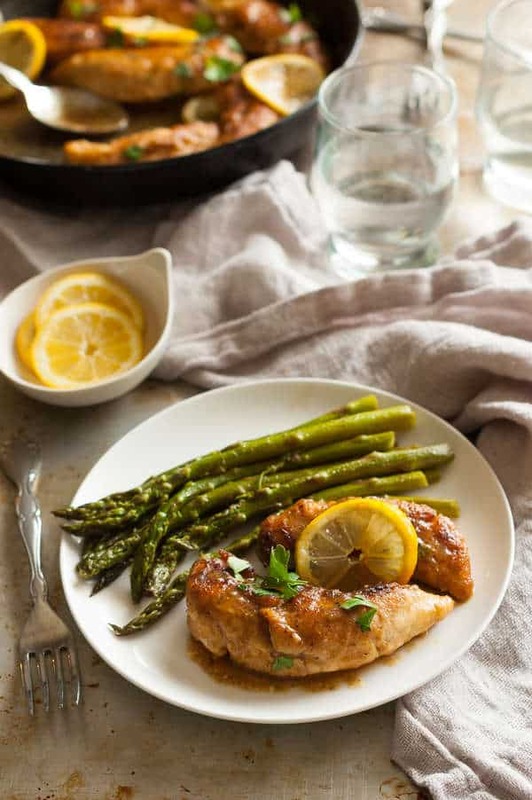 This One Pan Paleo Lemon Chicken Recipe, gluten-free, dairy-free, clean eating, and Whole30 compliant. I make it all the time. We love it. 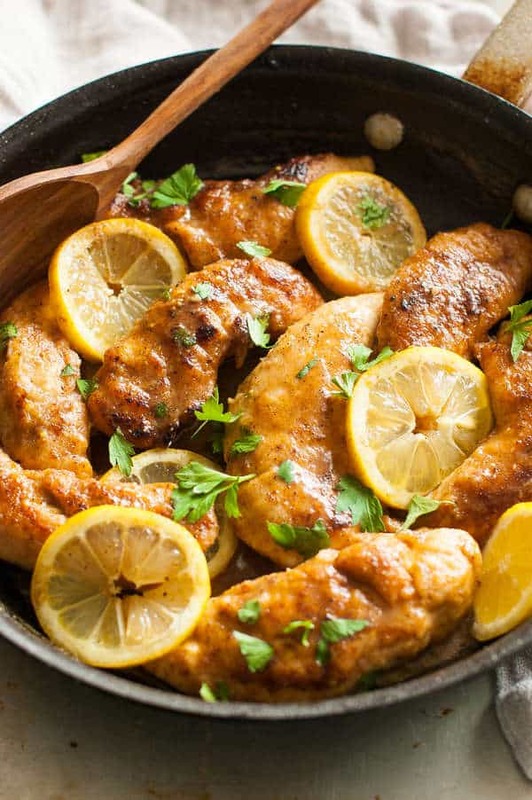 This is a one pan Paleo lemon chicken recipe. This recipe is much more about the technique than the ingredients. It’s a great weeknight meal to make for the whole family. This Paleo lemon chicken recipe has a simple breading and after it’s all golden brown, you make a quick lemon sauce right in the pan. Make extra sauce to put over noodles, cauliflower or the carb of your choice. My children love this sauce and fight over all the last bits in the pan. I really like it with roasted asparagus or roasted broccoli on the side. If you have picky eaters, you can even give them a chicken finger before you put the lemon sauce on it and let them dip it in ketchup or honey mustard sauce. Whenever I make this for guests, they are always surprised how fast it comes together and how good it tastes for so little effort and they always want the recipe. This easy weeknight clean eating lemon chicken skillet dinner recipe is another one of my recipes I’ve made a hundred times or more. Yes, when I get a recipe the whole family can eat and enjoys, I make it a lot. The whole family loves it and it’s easy to adapt. I’ve made this so many weeknights and even for company. The only person in my family who doesn’t like it, won’t eat chicken. Ever. So she doesn’t count if you ask me. We’ll each them as plain chicken tenders with some Italian seasoning, paprika and garlic powder added to make them taste really flavorful. 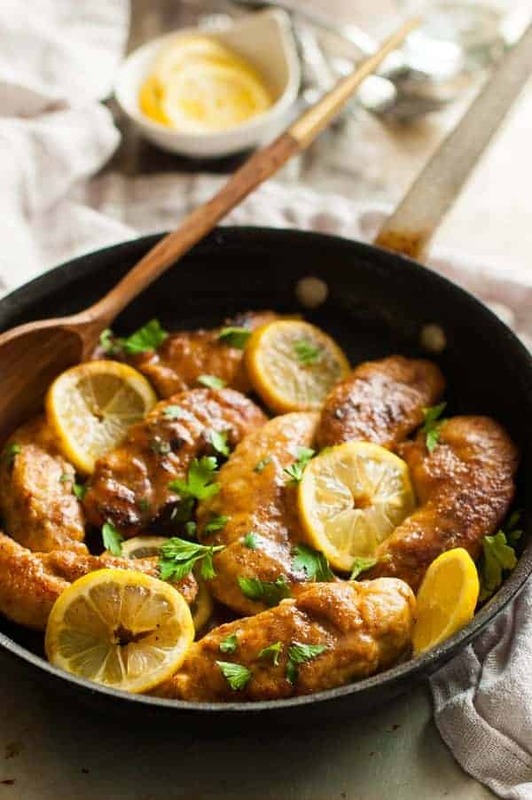 You can take this basic clean eating lemon chicken recipe and at the end, use about half the amount of lemon and add heavy cream (not half and half or milk) and stir until it thickens and eat it either as a sauce on the side or make a little more and make it a little thinner and use it as pasta sauce. Add some onions to the cold pan and do the same thing with the seasoning and flour and you’ve got easy pan-fried onions. My entire family fights over these. On fish for fish tacos. In a taco salad. Just use the ingredients you would normally put on a ground beef taco salad, but instead use this breaded chicken. So good. Especially with grape tomatoes and homemade mayonnaise as the dressing. Make the chicken tenders and at the end, use cream or half-and-half and make a simple white sauce right there in the pan. It’s really good if you add some roasted garlic. Then it’s kind of like chicken fried steak, but with chicken. Do the same technique I mention right above this, but use hamburger or pounded steak and you’ve got an actual chicken fried steak. Add some spices, like red pepper, garlic and plenty of pepper and I like it better than chicken fried steak from most restaurants. I hope you like my recipe. I think it’s awesome and I hope you do too. Please comment below and let me know what you think about it. This has a simple breading and after it’s all golden brown, you make a quick lemon sauce right in the pan. I’ve made this hundreds of times and I still love it. Make extra sauce to put over noodles, cauliflower or the carb of your choice. In a medium sized mixing bowl, combine the flour with a few pinches of salt and pepper. Toss the chicken tenders in the flour until well coated. Heat 2 tablespoons of oil to medium/high in a large frying pan. Add 1 tablespoon of the butter. Add half of the flour coated chicken tenders to the skillet, keeping them from touching. Cook until the chicken is golden brown on the bottom. Turn over and brown on the other side. Remove chicken from pan and add in the remaining tablespoon of Olive oil and 1 tablespoon of butter. Add the remaining chicken tenders to the pan and cook in the same manner. When the chicken has been browned on both sides, add the previously cooked chicken back to the pan. Pour the chicken stock and lemon juice into the pan and bring to a simmer. Let simmer for 2-3 minutes, or until sauce has reduced by half and thickened. Check seasonings and add more salt, if desired. Add lemon slices and chopped fresh parsley to the pan to garnish. I hope you like my one pan Paleo lemon chicken recipe as much as my family and I do. It’s a real mainstay at our house. Delicious! I made this with almond flour and it was so good! I’m so glad you like it. I was afraid to try it with almond flour at first, but it really is good with a nutty flavor and crusty texture. Thanks for your comment too. Maybe other people will get brave and give it a try! Made this for dinner yesterday. Everyone loved it! This was surprisingly very easy to make. And it tastes delicious! So much flavor, but it doesn’t require a ton of ingredients. Simple and delicious. 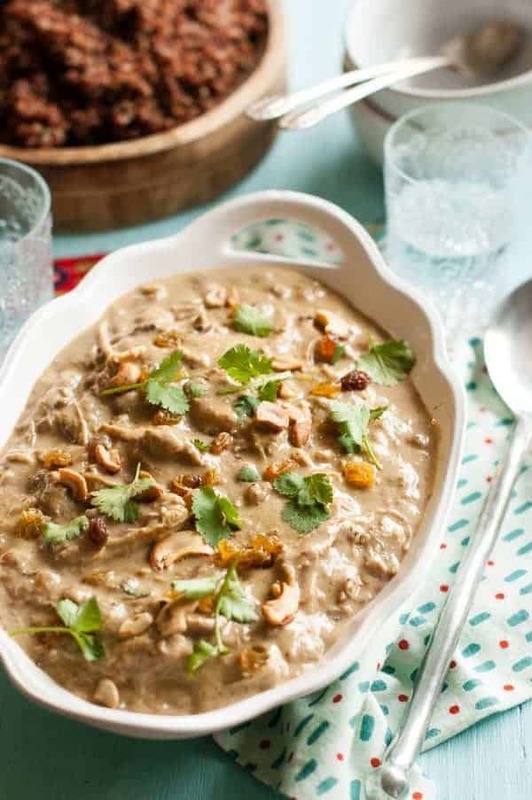 Perfect for an easy weeknight meal, but also nice enough to serve to company. I’ll be making this often! I’m so glad you like it. I made it so many times that we’re all sick of it. Luckily, that took like 200 times, so for most people, you’re probably good. . . I tend to make the same thing over and over. At least that’s one of the good things about my blog now is that it forces me to try lots of new recipes now. I made this for dinner tonight and it was SOOOO GOOD! Super easy and Delish!!! I also made your Lemon Bars prior to making dinner. Equally AMAZING! I’m so glad you liked them both. Sounds like you love lemon! I know you said Coconut flour does not work the best but what about almond flour? It’s ok. It works fine until you put the sauce in the pan, then it falls apart a bit, so just serve it separate. It actually has a good, nutty taste when you use it for breading, which I like. Do you have to use chicken stock? No. Chicken broth or even water will work. You just get the richest flavor with chicken stock. Love your recipes. Doing your coconut shrimp in pina colada sauce tonight! I am going to make this tonight! What would you suggest serving it with Rebecca? Well, I’m late answering, but I like to eat it with einkorn penne pasta and roasted asparagus or broccoli. I am confused as to all the oil and butter. If I only put 2 tablespoons of oil in the pan, what do I with all the other oil and butter? I’m so sorry about that. I changed the recipe and missed changing all of it. It’s only 2 Tbl. of oil, although you may have to add a bit more as the chicken absorbs it. Then the butter is put in right at the end. Really? Put the chicken in cold oil? I have never done this (complete rookie home chef) and it seems to go against the very limited culinary knowledge that I do possess. Ha ha. Yes! It does go against everything, but it totally works for lazy people like me that don’t like to flour the chicken separately. That way you don’t have to touch the chicken as much and don’t dirty nearly as many dishes and it turns out fine for me. I’ve done it hundreds of times with frozen chicken, which flour doesn’t stick very well to anyway. It may sort of work. I know a light coat of arrowroot starch works, and that’s gluten-free. But a gluten-free flour blend would work too. You can try it, but coconut flour is very different and I haven’t had good luck using it for breading or thickening because it absorbs too much. I made this tonight for my family and it was AMAZING!! Thank you so much for such a delicious, simple recipe! I’m glad you like it! I’ve made it hundreds of times and love it with some pan-fried onion rings and I usually make some einkorn pasta to go with it for my children and make a little extra sauce to go over the noodles. I’m working on FINALLY getting the onion rings recipe on my blog because they are THE BEST! Looks easy, light and delicious. Pinned! Yep. Not fancy or anything but good and healthy and filling and easy. I will love this recipe because I love chicken anything but I really love the flavor lemon too.Thanks for posting this. and it doen’t look to difficult to make either. My daughter loves chicken fingers, I am pinning this to try later. I really love the fact that they are gluten free too. thanks for sharing this tasty recipe with us. This sounded so delicious it just stopped me in my tracks.I just recently bought quinoa and have been wondering how to use it.I was pleasantly surprised to find all these wonderful recipes for it and especially this one.Thank you for sharing.